Summer is tough on your skin. 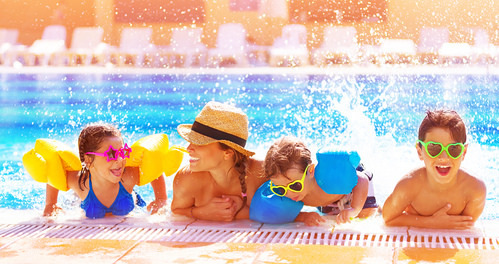 Sun, heat, chlorine, salt water, bugs and nature — all can wreak havoc. In the past, I had more breakouts and skin reactions during the summer than at any other time of year. 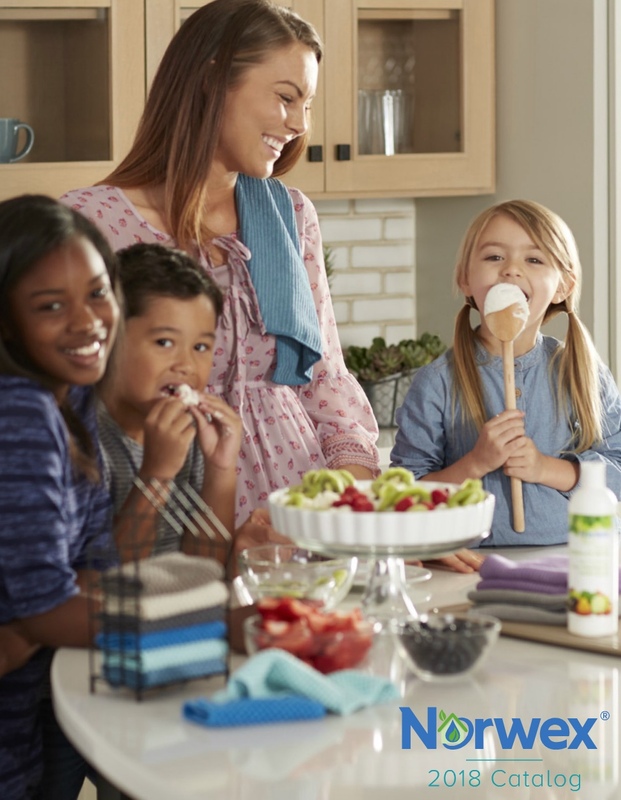 I know now, after making the switch to Norwex, that the store-bought personal care products I used to use to protect myself from the elements often only exacerbated my issues. I did NOT do well with a lot of the chemical ingredients in moisturizers, sunscreens and even some soaps! Do you know what your skin care products contain? The Environmental Working Group estimates the typical American woman exposes her skin to 168 unique chemical ingredients daily through creams, lotions, gels, cosmetics and cleansers. And, it only takes 26 seconds for our skin to absorb the chemicals from those products. Sodium laureth sulphate/SLS/SLES: This is a type of detergent used in shampoos, shower gels and soaps (it’s also found in many household cleaning products) to create foamy bubbles. Science says: The U.S. Environmental Protection Agency recognizes this chemical as a potential carcinogenic. It also can cause skin irritation and dry out skin, hair and scalp. Phthalates (including dibutyl and diethylhexyl): These are a type of plastic that make an impact on product texture and flexibility, and help products bond to skin. They also are used as a solvent in many of the perfumes used in creams and moisturizers. Science says: Numerous studies have tied phthalates to reproductive and endocrine disorders. Scientists generally recommend that children and pregnant women avoid phthalate exposure. What’s also concerning is that in the U.S., manufacturers are not legally required to disclose the presence of phthalates in products. Instead, they can use umbrella terms, such as “fragrance” or “parfum,” making it especially hard to dodge them. I provide even more information about phthalates here. Parabens (ethylparaben, methylparaben, propylparaben, butylparaben and isobutylparaben): A group of chemicals that prevent bacteria growth and extend product shelf-life and are commonly found in deodorants, body scrubs and lotions. Science says: While the medical community is split over whether parabens pose a risk at permitted levels, everyone agrees they are a known allergen and should be avoided by anyone with sensitive or reactive skin. Oxybenzone: This is an active ingredient in many sunscreens. Science says: Numerous studies have linked this ingredient to skin irritation and allergies, hormone disruption and low birth weights in baby girls. Worth noting is that the U.S. Centers for Disease Control have found that oxybenzone is present in the urine of 97 percent of Americans already, and exposure should be limited. Hydroquinone: This is a chemical bleaching agent used in skin brightening moisturizers and anti-ageing creams. Science says: This chemical is regarded as such a highly toxic ingredient that it is banned in concentrations above 1 percent in Europe. Like many controversial ingredients, it also has been listed as a potential carcinogen. Arguably the biggest risk comes with the fact that some formulations contain trace amounts of mercury, which is itself associated with an array of health concerns, including kidney, eye and brain damage. Triclosan: This is a type of pesticide with antibacterial properties and is often used in hand soaps, shower gels and deodorants. Science says: There is some debate over whether it is our reliance on triclosan and other sanitizing chemicals that is contributing to the growing global problem of antibiotic resistance. Triclosan has also been linked with endocrine and thyroid function disorders and, in 2015, the European Chemicals Agency recommended its use be phased out across the continent due to the recognized risk of repeated use. This list unnerves me — especially given my own history with cancer. So, it’s a huge relief to know I can trust that Norwex skincare products are free of SLS, SLES, parabens, phthalates, mineral oil, propylene glycol, synthetic dyes and other questionable chemicals. I love our collection of basic personal care products, including the Hand Cream, Shower Gel and Body Lotion. They are safe, mild and smell great and contain only natural botanicals like coconut oil, grape seed oil, organic aloe vera, and organic shea butter to moisturize and cleanse skin. Meanwhile, with our microfiber Body Cloths, you don’t even need to use shower gel or soap. A little water and a good scrub gets the job done! 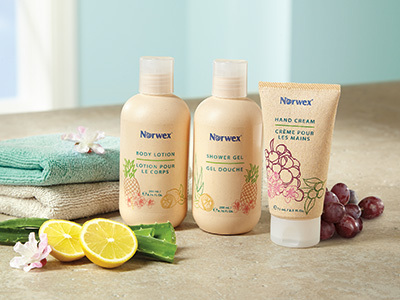 For those of us with mature skin, Norwex has created the Naturally Timeless line. All four products in this line (Facial Serum, Day Cream, Anti-Gravity Night Cream, Radiant Eye Cream) are made with eco-friendly ingredients that help moisturize, smooth the appearance of fine lines and wrinkles, improve clarity, and contour the skin for a healthier, more youthful appearance. From personal experience, I can say that since making the switch to Norwex, my skin feels better than ever, and I don’t have to be concerned about how safe it is for my body, or whether it is going to make me break out once the weather warms up. What’s better than fun in the sun (or shade) without worry? If you would like to learn more about our great skin care products, or if you have any questions about Norwex in general, I would love to hear from you!